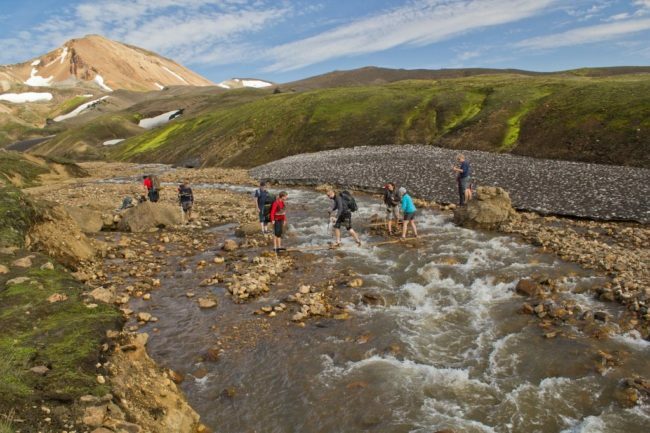 Laugavegur Trek – Landmannalaugur and Thorsmork – The Great Canadian Travel Co.
Iceland’s best known hiking trail, the Laugavegur Trek, named one of National Geographic’s 20 Best Hikes in the World! 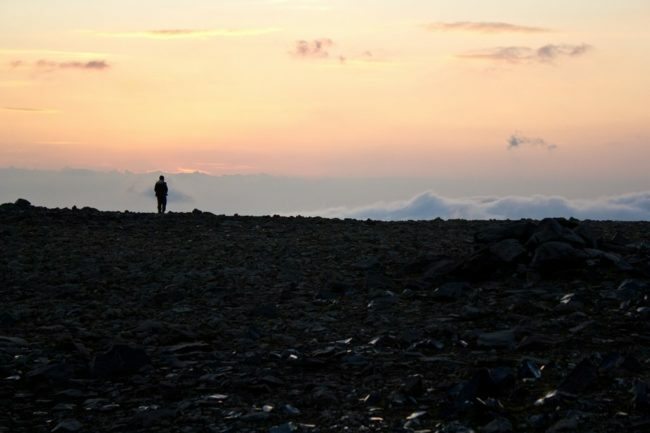 A five-day vehicle assisted trek from hut to hut. 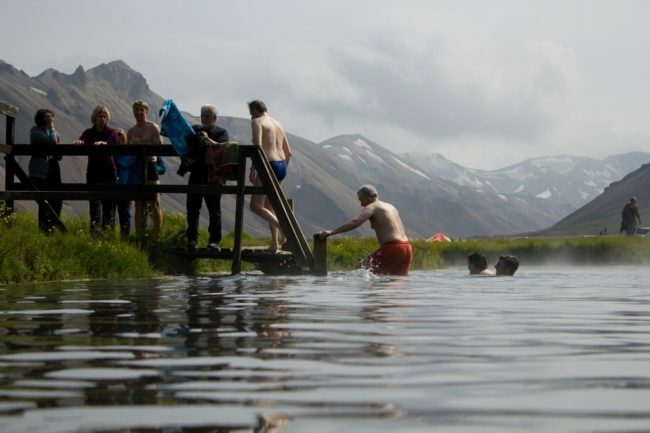 This trail takes adventurers from the geothermal valley of Landmannalaugar and the southern highlands, south to the Þórsmörk valley, at the foot of world famous Eyjafjallajökull volcano. Prices are shown in US$ per person and are subject to change based on currency fluctuations of the US$ to the Icelandic Kronur. Rates are also available in CA$. Current prices will be quoted at the time of reservation. 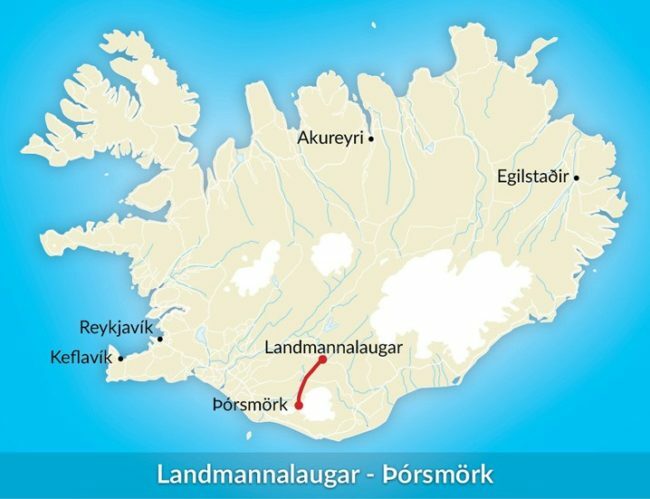 We take the regular bus at 08:00, that during the summer months drives the mountain tracks that lead to Landmannalaugar, passing by the Hekla volcano and other volcanoes in the Dómadalur area. 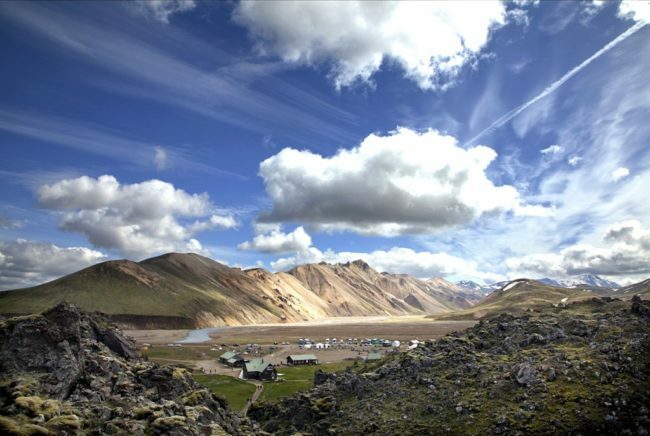 Arriving in Landmannalaugar at noon, we have a lunch and then head south into the mountains. 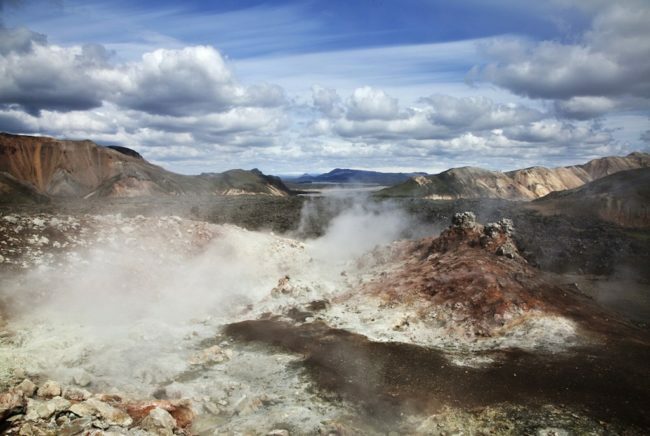 The trail takes us past small gorges, steaming hot springs and yellow mountain ridges. Arrival at Hrafntinnusker mountain hut, were we will stay the night, in the late afternoon. 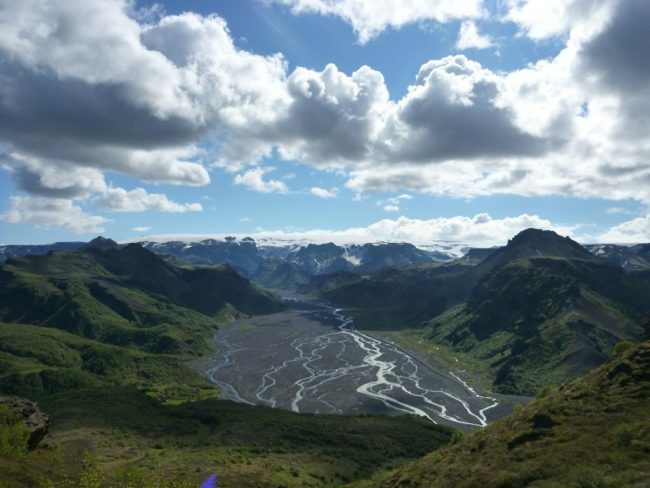 We continue up and down through the small valleys and gullies of Emstrur, where the great Mýrdalsjökull glacier rises only a couple of kilometres away. 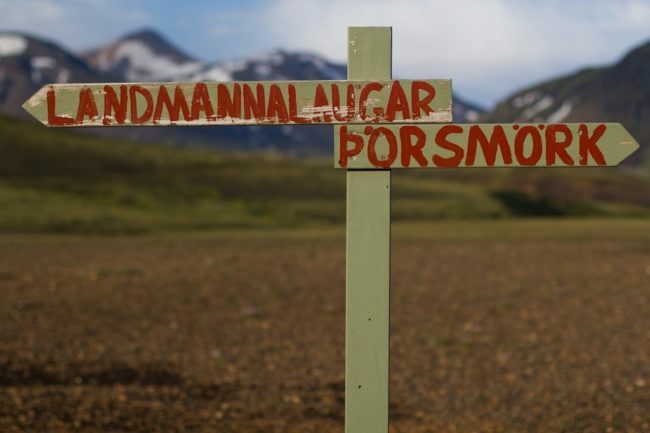 At the end of the day the vegetation starts to grow thicker and higher as we descend in to Þórsmörk’s (the woods of Thor) green valleys filled with arctic birch forests and colourful flowers. Night in one of the huts in Þórsmörk. 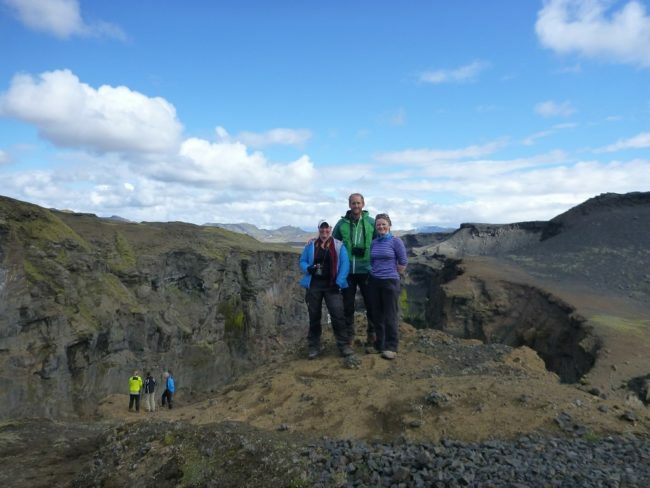 We spend the morning in Þórsmörk where we walk along one of numerous paths. 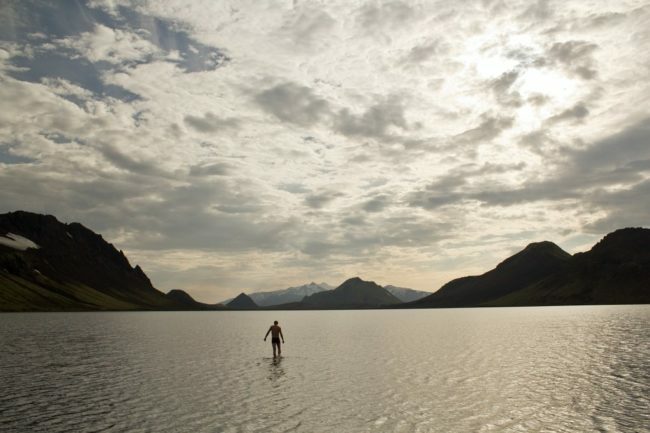 For example, we can visit to the Sönghellir cave (“Song cave”), climb up the small mountain of Valahnúkur from where magnificent view can be enjoyed, before taking the afternoon bus to Reykjavík. Arrival at Reykjavik Central bus Station at 19:20, where the trip ends. *All of the huts are heated, some have electricity and some have hot water. They have bunk rooms with single and twin beds, participants have to be prepared to share a bunk with other travellers from the group. 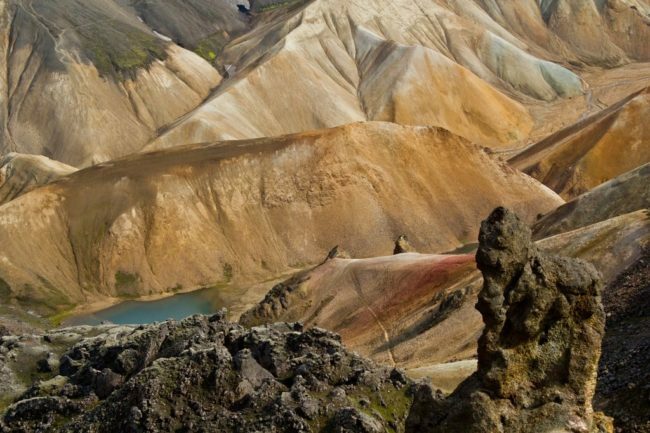 The trail crosses many spectacles including the third biggest geothermal zone in the world, through yellow rhyolite mountains, over black deserts, past great canyons and finally into the verdurous valley of Þórsmörk. 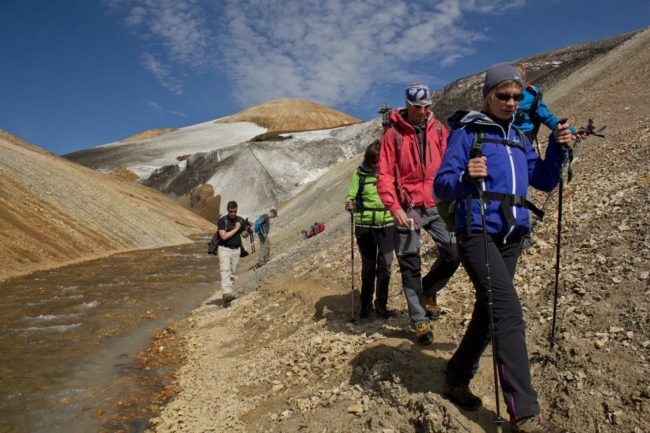 It is no coincidence that the “Laugavegur” hike each year attracts travelers from around the world in addition to being a great favorite amongst locals. Come see what all the fuss is about! 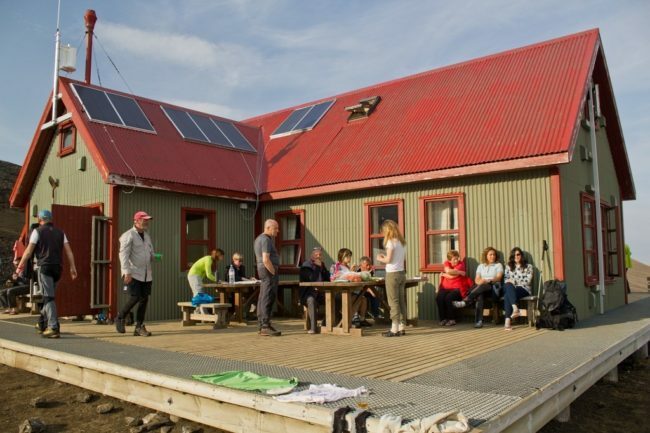 Accommodation in mountain huts. Mountain huts: All of the huts are heated, some have electricity and some have hot water. They have dormitories with single and twin beds, but no private rooms. All travellers in the group will be in shared dormitory accommodation. 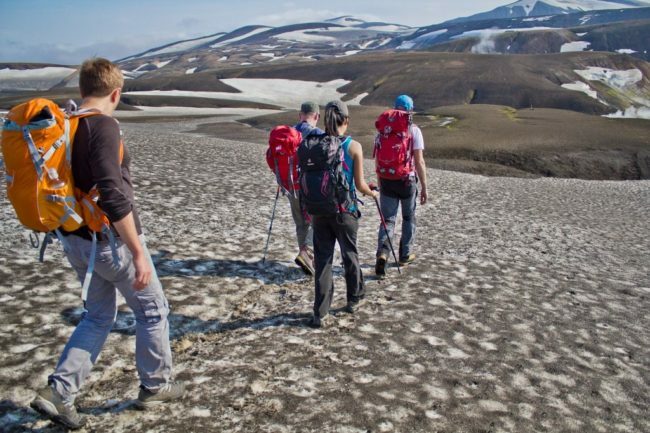 You can extend this trek and go from Þorsmörk over Fimmvörðuháls (right next to the craters from the 2010 eruption) to Skógar.